Charles Marrick is found by his wife sitting peacefully on the sofa in their living room. Peaceful apart from the knife wound in his neck – and the vast amounts of blood that have drained from his body. Once DI Wesley Peterson starts investigating, it seems that there is no end to the list of suspects – one of the most common adjectives to describe Marrick is “evil”. But soon, a second body is found in the same circumstances – the body of someone who is almost the complete opposite of Marrick. Meanwhile, Wesley’s archaeologist friend Neil Watson is being sent anonymous letters telling the story of Brother William, a friar at a medieval abbey – a story that involves bodies being drained of blood… But it’s not just the distant past that will have a bearing on the case. 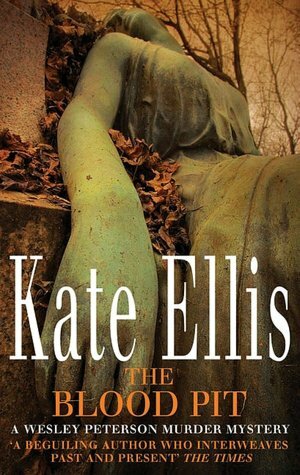 My reviews of Kate Ellis’s work basically write themselves – it’s simple. The book has a clever, intricate plot, with a set of well-defined characters. Red herrings abound, enticing the reader to look the wrong way. I did think in particular that one character was being dangled in a “last person you’d expect” kind of way very effectively – a lovely bit of misdirection. And once again, the solution, surprising as it may be (although I did guess the killer), has a twist in the tail – two, in fact, one of which will have a long term effect on the series – possibly. Certainly it’s still being mentioned in The Jackal Man, one of the later books that I read out of sequence – another cracking read, that one. Not going to say any more but to Highly Recommend yet another strong entry in this excellent series – if you haven’t tried it yet, you really, really should.